Britain is on the brink of a subsidy-free renewables “revolution” which could create up to 18GW of new capacity by 2030 and attract £20 billion of investment, analysts have claimed. Aurora Energy Research said the explosion of subsidy-free renewables would largely snuff out the already dim prospects for new combined-cycle gas turbines (CCGTs). “Back in 2010 at the start of the Electricity Market Reform process in Great Britain, few would have imagined that by 2018 we would be talking about a subsidy-free future for renewables,” said Aurora head of product development Mateusz Wronski. “Yet, this is where we have arrived, and our research highlights clearly the enormous prize and potential in the market, not only in Great Britain but across Europe. Analysis by Aurora suggested 9GW of solar, 5GW to 6GW of onshore wind and 3GW to 4GW of offshore wind could be built without subsidies by the end of the next decade. It predicted solar and onshore wind would reach grid parity in the early 2020s, whilst offshore wind would hit the milestone in the late 2020s or the 2030s. To achieve the projected build out, financing costs would need to be lowered through a better understanding of the merchant risks for renewable generation. He continued: “The critical bit is getting comfortable with the risks and being able to finance these projects at a reasonable rate of return of something like 9 per cent. “If that doesn’t happen; if financing these merchant renewables occurred at say 13 per cent; then that simply doesn’t work because the cost of capital is too high for merchant renewables to become viable”. One way of reducing merchant risks would be to “create a benchmark for the industry of a credible worst-case scenario of how low capture prices for renewables could go”. “This is about the investment community and developers sitting together and working out a common understanding of the risks in this area”, he explained. Wronski said the analysis highlighted three main sources of risk to capture prices for renewables: commodity prices, including the carbon price; cannibalisation by other renewables, which depress prices as more come online; and the composition of the energy system and its impact on flexibility. “If you are to deploy an additional gigawatt of solar when there’s a lot of batteries and electric vehicles, you get a much higher capture price than if you were to deploy the same gigawatt in a system which is very inflexible,” he added. Subsidy-free Contracts for Difference would be a “game-changer”, according to Wronski, “providing a bridge before a deeper [power purchase agreement] market emerges.” He said they would be essential for offshore wind to achieve Aurora’s projections. The boom would be even faster and bigger if renewables were able to stack revenues from the capacity market and ancillary and balancing services. Just allowing them to participate in the capacity market could bring forward grid parity by five years. Wronski said the growth of subsidy-free renewables would have major implications for the rest of the power sector, reducing the utilisation and profitability of baseload generation but boosting the business case for flexible assets such as peaking plants, batteries and demand-side response (DSR). 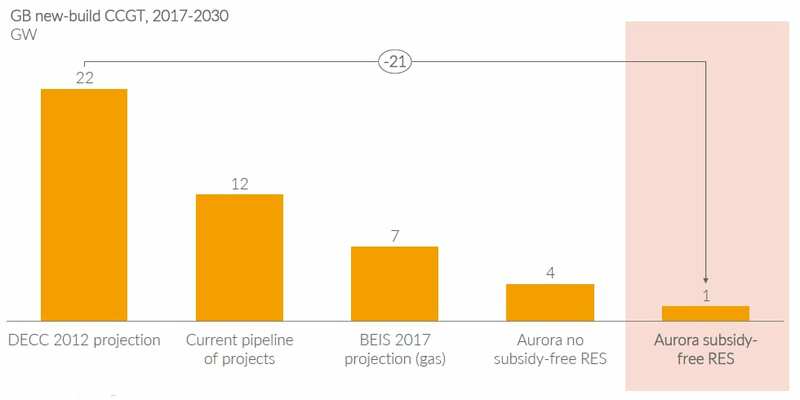 If the revolution materialises, Aurora expects just 1GW of new CCGT capacity to be deployed between 2017 and 2030 – a near complete collapse when compared to the government’s 2012 projection of 22GW. “Batteries which thrive on arbitrage benefit from the additional volatility created by additional renewables, especially solar,” said Wronski. “Similarly, gas reciprocating engines and DSR would benefit in that scenario”. The findings were revealed earlier this week at an event hosted by Aurora in Oxford, during which energy and clean growth minister Claire Perry confirmed that the government would conduct a formal review of the capacity market “later this year”. In September, Perry officially opened the UK’s first subsidy-free solar project – the 10MW Clayhill solar farm in Bedfordshire. A few months later Hive Energy and Wirsol Energy unveiled plans to build the country’s biggest ever solar farm (350MW) in Kent without any subsidies.